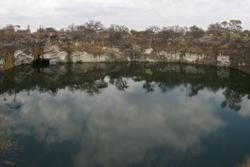 En route to the Etosha National Park from Tsumeb lies the Otjikoto Lake, so named by the Herero people due to it being regarded as bottomless. The San named it Gaisis which means "very ugly", a reference to its dark waters of which they were afraid. The lake is thought to have been exposed when the roof of a cave fell in revealing the underlying river system. Measured to be approximately 102m long, its depth is not so certain, the deepest known corners are projected to be around 100m in some places. In 1850, Sir Francis Galton and Charles Anderson were the first Europeans to set eyes on the lake and, to the horror of the local people, took a swim in the lake. During the First World War the battle was fierce between British forces and German colonial troops. In an effort to safeguard their weapons and artillery from the enemy, the Germans dropped all they had in their possession to the depths of the Otjikoto Lake. Many of these remnants have since been recovered and can be seen in the Tsumeb Museum. There are rumors however of a great treasure in excess of 6 million gold marks still lost in the murky waters. Another notable feature of the Otjikoto Lake is a species of fish only found here. Tilapia guinasana is a mouth breeding fish endemic to the lake as well as sister Lake Guinas. Guinas is larger than Otjikoto and also rumored to be deeper as well as more scenic. Rumors of deep underwater tunnels and river systems that connect the lakes have never been proven.